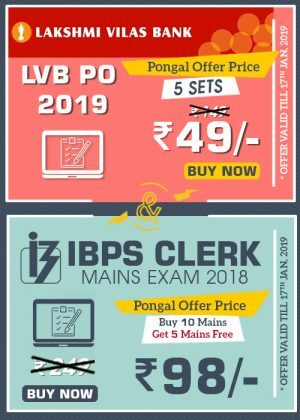 IBPS CLERK Mains Exam 2018 is coming fast than you think and there are only less days to make your preparation fruitful. The preparation strategy must be fixed in such a way that the actual ones will help to score more marks in the IBPS CLERK mains Exam 2018. The IBSP CLERK Mains Exam 2018 is scheduled to happen on 20th December 2019. The key to score more marks lies in scoring in the General Awareness, banking Awareness and English Section. So, one needs to be preparing in such a way that, the aspirant must get maximum marks in the above said section. Practising is the key to score in these topics and aspirants must read at least 6 months Current Affairs to crack the General Awareness Section and Banking Awareness Section. 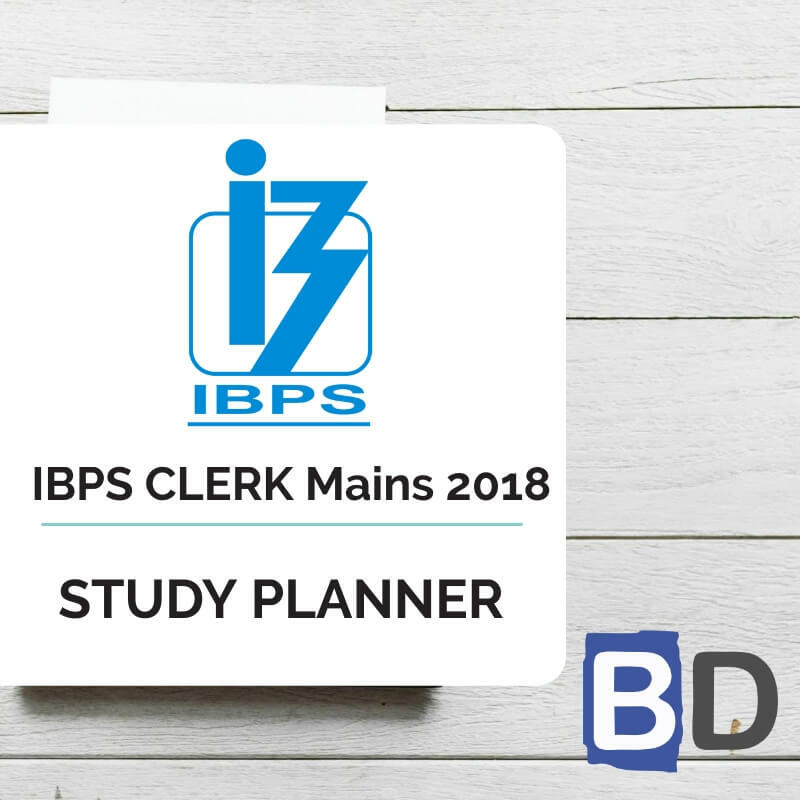 We have started the IBPS CLERK Mains Exam 2018 – Planner where we are providing practice questions from the above topics which will help the aspirants to increase the solving ability and to learn new questions. We have also included the New pattern Questions which have been asked in the recent exams like SBI Clerk, IBPS RRB Assistant and others. 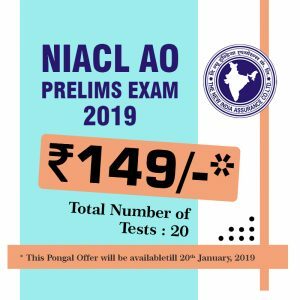 This will assist the aspirants in analyzing the type of questions and to know the nuances of attending the Different type of questions. D.1-5) Find the missing number in the following number series. Q.1) 21, 34, 51, 76, 113, 166,? Q.6) 784 , 809 , 845 , 894 , 958 , ? Q.8) 7800, 8241, 7757, 8286, 7710,? Q.9) 8281 , 8649, 9025 , 9409 , 9801 , ? Q.10) 699, 707, 716, 780, 805, ? Q.11) Two trains A and B running in the opposite direction and both the trains cross each other in 10 sec. Train A crosses a man standing in the platform at 60 km/hr in 3 sec. 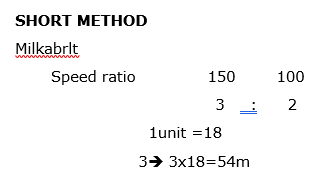 Find the length of train B (in metre) which is running at the speed of 120 km/hr? Q.12) A train crosses a 300 m long platform at a speed of 72kmph in 25 sec and also passes a second train 250 m long running in opposite direction towards each other in 15 sec. what is the speed of the second train? Q.13) Ajith covers three equal distances with speeds of 4km/hr, 5km/hr and 6km/hr. If total time taken by him is 37 minutes, the total distance covered by him is 50% of the distance covered by Vijay, the total time taken by Vijay is 2 hours, find the speed of Vijay? 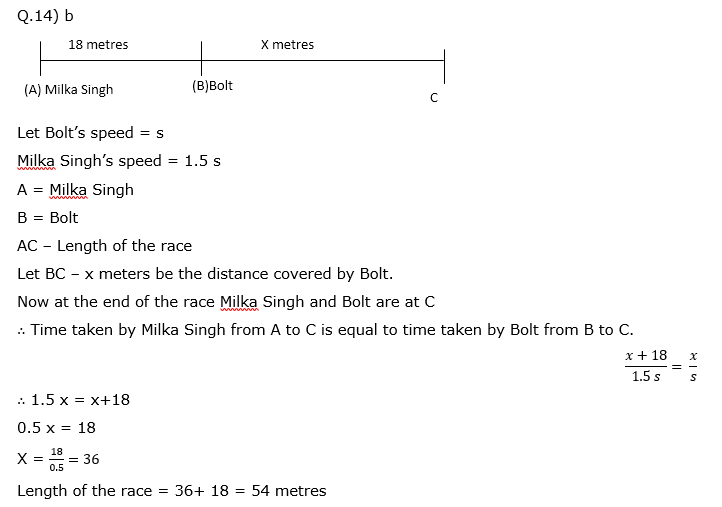 Q.14) Milka Singh runs 50% faster than Bolt and is able to give Bolt a start of 18 metres. In the end of the race is dead heat. What is the length of the race? Q.15) A man perform a journey of 850 km partly by bus and partly by car. He takes 12 hours if he travels 250 km by bus and rest by the car. He saves 2 hours, if he travels all the distance by car. The speed of the car is 35 km/hr more than the speed of the bus. The bus covers a distance of 400 km in? Q.16) A car running at a speed of 40 km/hr covers a certain distance in 4 hours. A jeep covers the same distance in 5 hours. The speed of jeep is same as the speed of a bus which has travelled for 2 hours. 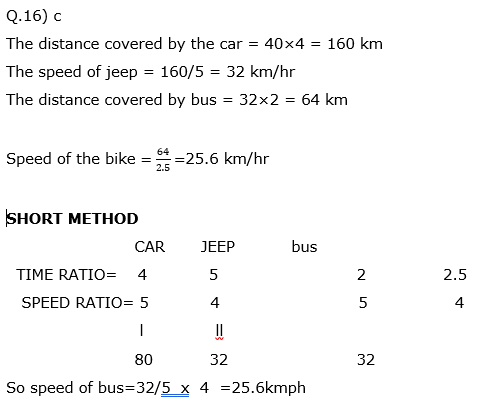 A bike covered the same distance travelled by Bus in 2.5 hours, then what is the speed of the bike? 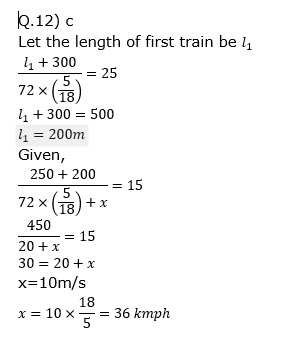 Q.17) Train A runs at a speed of 15 m/sec and reaches its destination in 7200 sec. Train B runs at a speed of 20 m/sec and reaches its destination in 4 hours. Train C runs at a speed of 25 m/sec and reaches its destination in 6 hours 48 mins. What is the respective ratio between the distance covered by the train A and C together and the distance covered by the train B and C together? Q.18) A train goes from P to Q with an average speed which is 25% more than the average speed by which it returns from Q to P. It stops for 3 hours on reaching Q and afterwards starts to P covering a total distance of 2000 km and a total time of 33 hours for the to and fro journey. 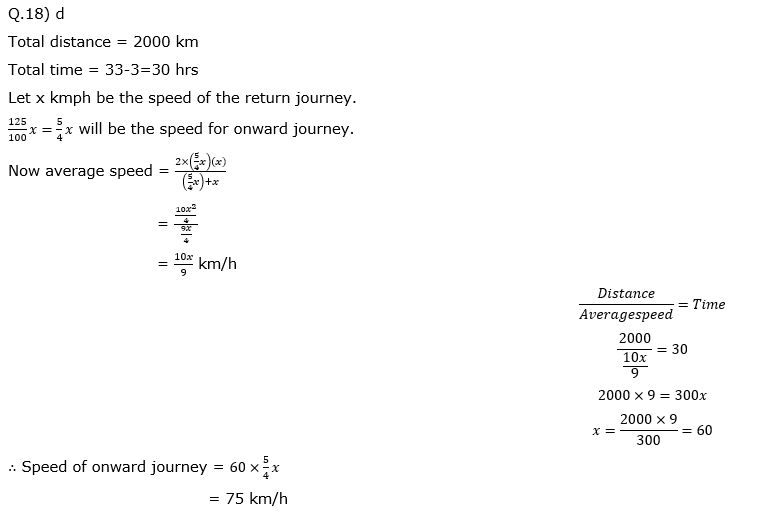 Find the speed of the train on onward journey. 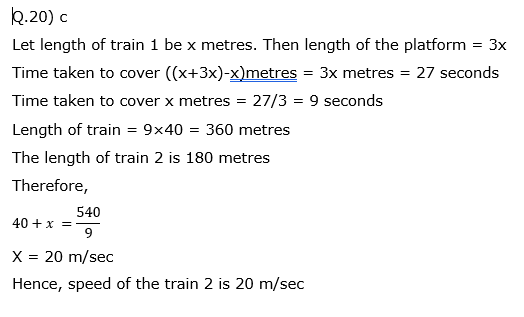 Q.19) Train A with L metres long pass a man in 9 seconds running in the direction of east to west. Train B with 170 m long running at 15 m/s in the direction of west to east pass the train A in 10 seconds, Find L value? Q.20) Train 1 running at the speed of 40 m/sec crosses a pole in 27 seconds less than the time it required to cross a platform thrice its length at the same speed. The length of the train 2 is half of the length of train 1. Two trains running in opposite direction and they cross each other in 9 seconds, the speed of train 2 is? Answers for the above questions can be found below. Hence, 1039 is the missing number. Hence, 999 is the missing number. Hence, 8335 is the missing number. 912, 932, 952, 972, 992,1012. Hence, 10201 is the missing number. Hence, 1021 is the missing number.